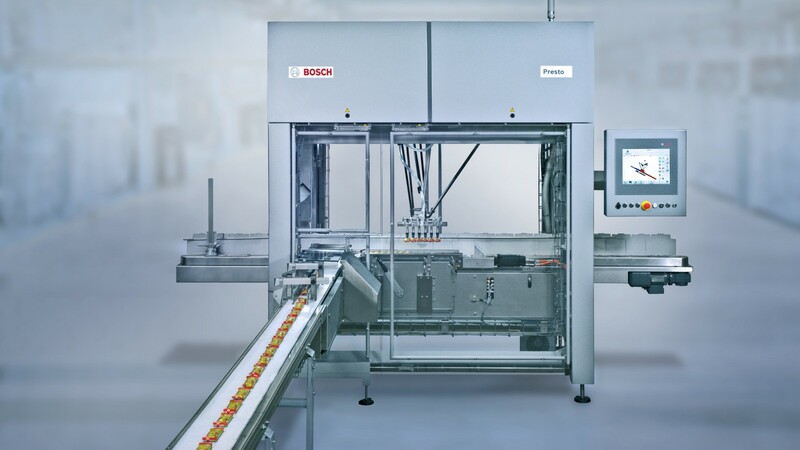 Bosch Packaging Technology enhances its D3 robotic platform with the latest Presto D3 machine range for non-stop operation. Designed for picking, placing and collating a wide range of food and non-food wrapped products, the upgraded robotic platform gives manufacturers the highest flexibility due to its modular design. “The new jam-prevention feature on our proven Presto platform is designed to improve the ease of machine operation and at the same time, increase the uptime and efficiency of this type of machine,” said Marc de Vries, sales director of the company’s robotic portfolio. Bosch developed the Presto D3 machine range in several configurations to make it adaptable to different factory and production layouts. With its simple integration with upstream and downstream packaging equipment requirements, the solution is available with one or two infeed conveyors, allowing the products to be picked up, grouped and placed flat or on edge directly into cartons or the infeed chain of a sideload cartoner. The modular design allows handles multiple product and carton types and sizes on the same machine, like single, dual or twin collators with options for left, center and right-hand entries. By using the latest human machine interface and Gemini 4.0 controller, operators can design simulations of new formats without actual products, saving valuable production time. For improved quality protection and accurate filling, the Presto D3 collator has an air blow ejection system that rejects products that are out of specification. Moreover, for non-stop machine operation, the reject station is followed by the new automatic unjamming device, which is available as a standard feature on the Presto D3 toploader. This way, without any operator intervention, it actively controls product jams, while the machine continues to run at full speed.